Plantar fasciitis and heel spur are conditions of the feet that are not particularly well known but still affect quite a lot of people. In the sole of the foot there is a thick tendon band called the plantar fasciitis. This band of tissue connects the heel bone with the ball of the foot and provides stability and enables the toes to bend. Plantar fasciitis is inflammation of this tendon band located under the sole of the foot. When your foot stands on the floor, the plantar fasciitis supports the entire weight of the body. This weight stretches the plantar fasciitis. 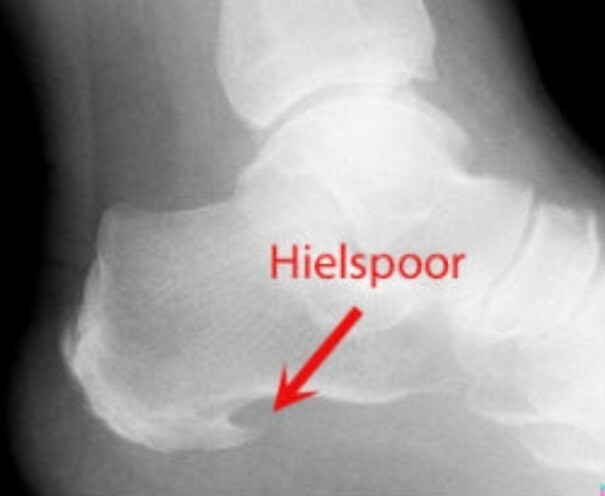 As a result minor tears may occur at the point where it is attached to the heel bone. The body usually takes care of repairing these minor tears. Strain may mean that minor tears do not heal. This produces a reaction causing inflammation. It is mainly the inflammation that causes the complaints. 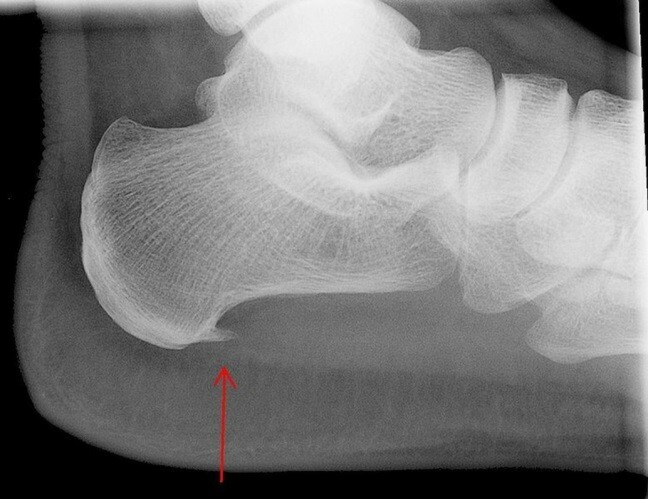 The bony outgrowth (thorn-shaped calcification) under the heel bone where the tendon band is attached is a heel spur (calcaneal spur). Research leads us to believe that this type of bony outgrowth occurs in approximately 75% of the adult population. However, this does not necessarily lead to any pain. Severe, persistent pain under the heel is usually referred to as ‘heel spur’. This is easier to understand than its medical term: ‘Plantar Fasciitis’. It is usually the result of strain. The typical complaint in the case of a heel spur is a severe pain under the heel, which can be clearly pinpointed. Heel spur and plantar fasciitis are strain injuries. Pain on the underside of the heel is the main symptom. The pain is most severe on getting up in the morning or standing up after sitting down for a long time. The pain may decrease during the course of the day but there may be a continuous dull ache on the inside of the heel or the entire sole of the foot at the end of the day (it fades when rested). Pain in the centre of the sole of the foot. There may also be signs of inflammation (redness/swelling). Most cases involve a clinical diagnosis that does not require imaging. In some cases an X-ray or ultrasound is taken of the heel in order to rule out other causes of the pain in the heel. In some patients a thorn-shaped calcification may be visible. Inflammation can be reduced by taking an ice bath or by applying ice to the painful area. Moreover, anti-inflammatory medication (NSAIDs) may be used for a few days. Heel spur is caused by strain. Using orthopaedic shoe inserts reduces the strain because the inflamed tendon is supported in its function. If there is an abnormal position of the foot this is also corrected using shoe inserts (high arch/flat feet). Exercises are the cornerstone of the treatment. You must perform the exercises every day at home in order to obtain good results. In principle physiotherapy is not necessary but may be prescribed to teach you these and other exercises and help you perform them correctly. Exercise 1: The most important exercise is stretching or elongating the actual tendon band. It is best performed before you start walking after a period of rest (in the morning when you get up). - Sit down with one leg crossed over the other. - Stretch your toes upwards. - You will observe that the tendon band is now tense. Hold this position for ten seconds while gently massaging the tendon band. - Repeat this exercise ten times. Exercise 3: Lean forward while leaning on a chair or table. Exercise 4: Stand on the lowest step of a staircase. If the pain persists infiltrations with cortisone may be considered. Cortisone has an anti-inflammatory effect and inhibits the immune system. The product is injected into the place where the plantar fasciitis is attached. The number of infiltrations must be limited because the product can seriously affect your immune system. The doctor will generally not administer more than three infiltrations to treat heel spur. It is only administered if a long-term exercise programme does not improve the complaints at all. Another option for treating heel spur is shock wave therapy. It is a non-invasive method that is only used if other conservative treatment is not very successful. Shock wave therapy eliminates calcification and helps heal chronic inflammation. Surgical procedures are rarely performed to treat heel spur. Surgery may only be useful in the case of a stubborn heel spur accompanied by severe pain.